September the 26th 1895 marks an historic Masonic landmark, for on that day the Duke of York Lodge was Consecrated at the Masonic Temple in Guildford Street, Cardiff and dedicated by Lord Llangattock, the Provincial Grand Master, assisted by WBro Marmaduke Tennant. 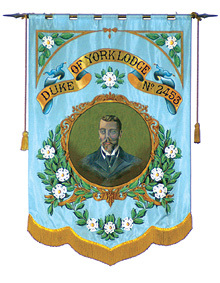 Whilst the Duke of York Lodge was created by Charter on 21 November 1892, the Consecration was delayed, due to difficulties in obtaining permission from HRH, the Duke of York, to use his royal title. The death of the Provincial Grand Master, Sir George Elliot, also played a part in this delay, the Lodge finally being Consecrated on 26 September 1895. This was also the occasion of the opening of the new Masonic Temple in Cardiff. In your current issue, under the heading “Craflets” appears the following: – Wor. Bro Marmaduke Tennant mentioned the singular fact that the ‘Duke of York Lodge’ was named a Royalty who was not a Freemason. To avoid any misunderstanding, may I be permitted to point out that on the formation of the Lodge, the Grand Secretary declined to place the Petition before the Grand Master until His Royal highness, the Duke of York had given direct permission to use the title., and only on production of the written permit did the Grand Secretary present the Petition for signature. The name “Duke of York” was not used or appropriated haphazard (ly), but was obtained with difficulty. Being personally responsible for so designation the Lodge, I do not wish anyone to imagine that the founders of the “Duke of York” Lodge appropriated the title without paying that need of courtesy which is due to our Royal House. The first Master of the Duke of York Lodge, WBro Charles Edwin Dovey, was installed in the presence of Lord Llangattock, by WBro Marmaduke Tennant, the Provincial Grand Master and both were made Honorary Members of the Lodge, on a show of hands. Due to the genial disposition and benign influence which had endeared him to the Members of the Lodge, WBro Charles Edwin Dovey was chosen as Master Designate, when an application was made for a warrant for a Daughter Lodge. Charles himself was a Member of the Committee appointed by the Grand Lodge to raise funds for a Masonic Peace Memorial in London and whilst he was Chairman of the Cardiff Masonic Hall Company, the premises were extended and a new organ purchased. Charles Dovey was to be the first of many famous Masters of the Duke of York Lodge – all of whose signatures may be found on a unique roll of Past Masters in the ante room of the Lord Swansea Temple. Included amongst the names of Past Masters can be found WBro SM Wilkinson, PPr.G.W. and WBro RH Seel, PPrG.W, the well known Auctioneers and Estate Agents and both brethren served the Lodge as Treasurers from 1917 to the early 1950’s. The noted Masonic ritualist and historian, WBro Rev J Sansam lies, PPrG.Chap. was Master in 1932 and was still President of the Lodge of Instruction in 1951. WBro T John Evans, OBE, PPrG.D. – an Oxford scholar and Chief Inspector of Schools in Wales, was Master in 1941. The two world wars saw brethren from the Duke of York Lodge giving their lives whilst serving in H.M.Forces. Three brethren died in World War 1 and seven, including a civilian, in World War 11. WBro E James Smith, PGStdB, the Master of the Lodge in 1959 was also a Past Master of the Hendre Lodge No.3250, the Lodge of Unity No.6030 and was first Master of St. Cecilia Lodge No.8748 which was sponsored by the Duke of York Lodge in 1976. He served several Lodges, in addition to the Duke of York, as organist for many years and conducted the Guildford Singers. This octet sang the anthems at the consecration of approximately thirty-five Lodges and the dedication of the Porthcawl Temple and the Chapel at the Albert Edward Prince of Wales Court in Porthcawl. He also conducted the Rumney and St. Mellows British Legion Choir, which was honoured to perform at the Festival of Remembrance, at the Royal Albert Hall, London in 1961. During the first hundred years, four Past Masters of the Lodge were appointed Officers of Grand Lodge, namely, C E Dovey, WC Jolliffe, PGStdB, EJ Smith and Roland Parker, PAG.DC. WBro Roland was Charity Steward of the Lodge for sixteen years, and has held the office of Chaplain for many years. He is also active in other degrees, being a Supreme Grand Chapter Officer and serving as Intendant General of the Red Cross of Constantine for South Wales and Monmouthshire from 1983 to 1991. For many years each Lodge was responsible for supplying its own drinks. During that time W.Bros. Stanley M Kendal, PPrSGW and Ernest James, PPrGD, were transport managers of Hancock’s and Brains Breweries respectively. The Duke of York Brethren drank Hancock’s and Brains beers on alternate years and much mirth was derived over the merits and strengths of the different brews! Seven brethren have occupied the Masters’ chair for two years namely, HC Bolter -1940/41, RE Takel, PPrJGW, -1965/66, Frank Parsons, PPrJGW, – 1973 and 1988, MI Swetman, PPrJGD – 1990/1991, J Beasley, PPrSGD – 1992 and 2008, A Gardener, PAGSupWks – 1997/1998 and RA Willett, PProvGStwd – 2004/2005. Famous Names who were Members of the Lodge include Bro Sir W Gascombe John and Bro Meurig Evans. The former, who was a blood brother of the artist Augustus John, designed the Lodge’s Past Masters jewel. This design was based on a ducal crown and white rose of York. Bro Gascombe John also sculpted many of the fine statues that can be seen in Cardiff’s City Hall, including one of St. David. Bro Meurig Evans achieved fame as a Judge on the North Wales circuit. WBro EJ Hobbs, PPrJGW, served as Lodge Secretary from 1967 to 1979. On 17 January 1984, he performed the ceremony to celebrate thirty years as a Past Master of the Lodge and in recognition of his many years service to the Lodge, was made an Honorary Member, as were EJ Smith and AV Jones, PPrAGDC, the latter travelling regularly from Devon in his retirement, to play the organ at Lodge meetings. The Hill family has played a prominent part in the Duke of York Lodge during the last forty years. WBro Harry Hill, PPrGStdB, was proposed into the Lodge by his brother-in-law WBro Herbert G Vodden, PPrGStdB, and Initiated on 17 February 1953. In 1967 he was installed as Master, during which year he presented the Lodge banner in memory of his dear wife. The banner was dedicated by the then Deputy Provincial Grand Master, WBro Harry F. Stockwell. WBro Alfred Ivor Hill, PPrGOrg, was Initiated on 18 May 1954, having been proposed by his blood brother WBro Harry Hill. Alfred was appointed Lodge Organist in 1955 and installed as Master in 1970. In 1976 he was appointed to Provincial Grand Organist. WBro Vivian Hill, PPrJGW, was Initiated on 20 December 1960, having been proposed and seconded by his father, WBro Harry Hill and his uncle, WBro Alfred Hill. Vivian was installed as Master in 1974 and in 1979 he became Secretary of the Lodge, and continued to serve in this position until 1997. In 1980 he was appointed Provincial Assistant Grand Director of Ceremonies, and promoted to Past Provincial Junior Grand Warden in 1986, He was also a Founder Member of Croeso Lodge No.8377. Last but not least, WBro David Roy Hill, PPrAGDC, Harry Hill’s son and Vivian’s brother, was Initiated into the Lodge in 1968. Roy subsequently became a Founder Member of the Ystrad Mynach Lodge No.8567 becoming its Master in 1979. WBro Peter Holmes, PPrJGD, Master of the Lodge in 1978 was also a Founder Member and Master of Ymlaen Lodge No.8419. Bro TJ Gwynne Williams, PPrGStwd, – Better known as “Gwynne the Bank,” was Initiated in 1969 and took over the position of Treasurer from WBro Reginald Pickett, PPrAGReg, PPrGW, (Mon), in October 1981until 1997, and in recognition of his good work in Freemasonry. he was made a Past Provincial Grand Steward in June 1986. This was a singular honour for both Gwynne and the Lodge, as he was the first Member of the Lodge to gain Provincial rank, without being installed in the Master’s Chair. In 1991 Bro Desmond Harding was also honoured as Past Provincial Grand Steward. Times have changed a great deal since 1896, in those days supper at the Lodge cost a mere two shillings, being 10p by present values. At one time, to build up the strength of the Lodge, the Masters had a strenuous time performing two and three ceremonies on the same evening. One older Member recalls being one of five Initiates, one of nine for his Passing and one of ten for his Raising! One Lodge was closed at 10.20 p.m. and on another occasion, after working a second degree, a third degree was begun at 10.00 pm and two actors visiting Cardiff, (described as “Theatricals”), were Initiated. WBro I Swetman was Lodge Secretary from 1997 to 1999 and WBro J Beasley has been Charity Steward since 1994 and has been the President of the Lodge of Instruction since 1998 and was promoted to Past Provincial Senior Grand Deacon in 2002. (Deceased in 2015) WBro A Gardener was Lodge Treasurer from 1999 to 2003, Chaplain from 2001 to 2002 and became Secretary in 2003 until 2013, he also became the fifth Member of the Lodge to be appointed to United Grand Lodge, with the rank of Past Assistant Grand Superintendent of Works, in 2010. In June of 2015 W.Bro Alan Gardener PAGSuptWks was appointed an Assistant Provincial Grand Master of the Province of South Wales, the first member of the Lodge to achieve this honour. In recent years the Lodge has had an influx of young new Members, who in turn are introducing other potential candidates and we are looking forward to adding to that number this year. Looking back over the years, the Duke of York Lodge has been served well by so many Brethren, too numerous to mention individually by name. It is to those un-named Brethren, together with those already named, that we give thanks for such devoted service over the last hundred and twenty- three years.